Can a national patient identifier be the panacea? The debate over a national patient identifier (NPI) resurfaced this year as proponents press that lack of a nationwide patient matching strategy is a hindrance to advancing health information exchange (HIE) and interoperability. While the College of Healthcare Information Management Executives (CHIME) is taking the lead through a private-sector initiative, the push for an NPI is being backed by a number of groups, including AHIMA, the CommonWell Health Alliance, Health IT Now Coalition, National Patient Safety Foundation, Healthcare Financial Management Association, and HIMSS. In theory, NPI supporters believe that a distinct national identification repository for patients would improve and streamline data sharing across disparate systems and enable more accurate patient identification. However, the concept has met its fair share of roadblocks over the past two decades. "This really should have been put in place to facilitate the proper exchange of information long ago. Like any good cornerstone of a building, it sets you up for the correctness of the rest of the build along the way," CHIME CEO Russ Branzell says. "The ability to match and correctly identify and authenticate a patient really is the cornerstone to appropriately exchanging information from a standards basis. Even if we can perfectly match every bit of your lab data, if it can't be matched to you, what good is it?" Over the past year, CHIME has called on the Senate Committee on Health Education, Labor, and Pensions to lift a ban in place since 1999 prohibiting use of federal funds to develop an NPI. The organization also has issued a $1 million challenge to the private sector through the CHIME National Patient ID Challenge to develop a solution that will "ensure 100% accuracy of every patient's health info to reduce preventable medical errors and eliminate unnecessary hospital costs." While many HIT professionals acknowledge the benefits of an NPI, some believe that the obstacles to creating an infrastructure to support a sustainable initiative are too great. Others suggest that it's possible to achieve patient matching goals to support national HIE and interoperability without an NPI. "I would be the first to say that uniquely identifying a patient is the key to meaningful use and accountable care. Once this has been achieved, you can get meaningful analytics that are not specific to one system," says Dan Cidon, chief technology officer with NextGate, a provider of health care patient identification and data management solutions. "With or without an NPI, we are seeing industry success in making this happen and achieving the goals of the Affordable Care Act." Craig York, program director of health care for ARGO, an analytics-sciences software vendor, agrees, adding that while the industry appreciates the potential of an NPI, it will not address the greater data integrity issues with patient identification on its own. "It's a Band-Aid approach. Any national patient identifier is dependent upon the person communicating to the registration clerk," he says. "If you look in places like Canada and England that have national health insurance and national health identifiers, they still have problems with duplicate records and records that are created without that identifier. It's not foolproof … I think people are looking for an NPI to solve their patient identification problem in an inexpensive way without having to extend a lot of energy, and that in and of itself is a misnomer." The advancement of national initiatives such as HIE, meaningful use, and accountable care have exacerbated the challenge of matching patients with medical records across organizational boundaries. The Office of the National Coordinator for Health Information Technology's (ONC) 2014 Patient Identification and Matching Final Report reveals that the collection of patient attributes and demographic data varies by EHR, making it difficult to exchange information outside of an organization. 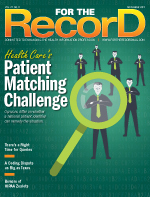 While error rates for patient matching vary across the industry (some estimates are as high as 50% to 60%), the report emphasizes that "current methods to match patient records cannot achieve a zero percent error rate in which every possible match is correctly made and erroneous matches are avoided." Along with variances in EHR structured data, York points to the substantial challenge the industry currently faces with duplicate records and inaccurate data collection during registration. "A great deal of information is either gathered incorrectly at [registration] or the information was previously gathered incorrectly," he explains, adding that tens of thousands of duplicate records can accumulate in a patient index over time depending on a health care organization's patient population. "Because existing health care information systems are so rudimentary in their analysis of potential duplicate records, many of those records go undetected." A recently published ARGO white paper points to the complexities and scale of the patient matching issue, noting that a Los Angeles hospital reported more than 1,400 patients registered with the name Maria Garcia. In its own analysis, ARGO found that the most advanced health care information systems typically miss 50% of the duplicate patient records. A study commissioned by CHIME reviewed the patient records in a small health system, which believed its duplicate record rate to be in the range of 30% to 40%. However, the findings revealed the rate was more than 400% in some cases due to the number of disparate systems involved. "What you have here is some systems work in isolation and are actually not fed to each other, so there are multiple records in which information might be gathered and not propagated out," Branzell explains. "If you aggregate this across a much larger geographic area such as Atlanta, with six or seven large health systems and thousands of physicians offices trying to exchange and correctly identify that patient, it is almost impossible." The ONC's own analysis of the issue raised serious concerns about patient matching and its impact on patient care, patient safety, and waste, according to Branzell. "I don't think anybody has their head in the sand by any means," he notes. "To the ONC's credit, I think they recognize this is a fairly significant issue. Having spent a lot of time working with ONC on this over the last couple of years, our team will tell you they are strongly supportive of getting to a place where we can match patients and identify patients correctly, but they also have their hands tied based on congressional law." NPI proponents believe that an identification system could address the problem of duplicate records by scrubbing databases of records and locating duplicates, according to Branzell. Then, a manual or electronic process would be deployed to either merge or eliminate duplicates. "There is a solution, in theory, that [an NPI] would facilitate the ability to get that done. Today, systems are used to run these reports every day, and a whole bunch of human beings go through this process of deduplifying those records," Branzell notes, adding that the cost to manage the process at some health systems runs in the millions. Acknowledging that the process of squaring up systems would be complex, he says that the goal would be to reach a point where "very minimal if near no duplicate records are being created because an identification system would hopefully, if not eliminate, nearly eliminate those things." The problem, according to Cidon, is that this type of initiative has been tried in other countries, but duplication remains a problem. Pointing out the success of NextGate's master patient index (MPI) solution in England, he asks, "Why do they need an MPI if they have a national ID system? "They have a problem in identifying—especially with foreigners—if a patient with a new ID is essentially the same as the application with the same name that came in six months ago," Cidon says. "With an NPI, you end up taking the problem and pushing it somewhere else essentially. Now you have duplicated national IDs, which means you still have fragmented data without a single way of correlating all of it." The concept of an NPI has been around since HIPAA was introduced in 1996. Essentially, it's a unique identification number to be used by covered health care providers, health plans, and clearinghouses to make health records more portable. Primarily due to privacy concerns, the NPI was taken off the table in 1999 when a law was passed prohibiting the federal government to work on patient identification. The law has been reaffirmed every year as part of the budgetary process despite ongoing efforts from national organizations to revisit the need for a national system of patient identification. "There were concerns by the federal government, by a couple of congressmen in particular at the time, that [the population] was not really ready for the government to have a specific medical identifier," Branzell recalls. "A lot has changed in the last 15 years, where now a vast majority of patient information is electronic. There is higher prevalence of patient errors relative to electronic exchange; as a matter of fact, it created new errors in the industry because of the inability sometimes to garner all of that information into one place." Even with HIT becoming widespread, Steve Kotyk, ARGO's health care business development director, believes politics will continue to keep an NPI off the table. "Consumer and privacy lobbyists are opposed to a federal national patient identifier concept, and so from a political standpoint, it has been a nonstarter for decades," he says. "I think the ONC is acutely aware of the political climate, and they're not going to push an NPI because they know it has to be approved by Congress." "We try not to even second guess at this point. The one thing we have tried really hard to put into the criteria is that this not be a proprietary-based solution owned by an individual company such that it would hold the patient information solutions as some kind of hostage," Branzell says. "Now the solution itself may be proprietary, but with the implementation and utilization, the desire of the team that has been working on it is that it be held for the advancement of patient safety, patient care, and cost reduction for the country." CHIME's NPI challenge is in its early stages; check the initiative's website for updates on the timeline for submissions and other announcements. Branzell, who believes the timing for the project is ideal, hopes a model will emerge that will eventually evolve into a successful public-private partnership and a universal standard. "We have not heard any negative controversy since we launched [the initiative]," he says. "As a matter of fact, we have written in the criteria that it must meet national privacy standards and national security standards." Other health care experts believe it will take a combination of efforts to reach the goals of precise patient identification, with new technologies possibly eliminating talk of an NPI altogether. "I expect that other technologies are going to make the point [of an NPI] irrelevant," Cidon says, pointing out how biometric data and machine learning algorithms can more definitively match patient records. "When I look at our customer base that consists of a lot of HIEs and accountable care organizations, I don't think that their biggest challenge is lack of an NPI. The biggest problem comes from not having clear standards on how to transfer information." The establishment of standards for how demographic information is collected will be a critical step, according to Kotyk. "You need to have a set of standards that address, at a minimum, information collected at the point of registration," he says. "For example, when you are collecting the name, are you collecting the legal name all the time instead of nicknames? Are you also collecting the patient's mother's maiden name to distinguish two patients with common names?" Branzell says that while a true national patient identification system is not the death knell for interoperability, it is a hindrance. "With an NPI, we accelerate and create a way of aggregating data based on the patient in a much different way," he says. "It also creates interoperability around the patient such that the patient now has the ability to take a much greater lead in their own care and patient information management."